The following is a not uncommon example of Library Serendipity. I love the public library! 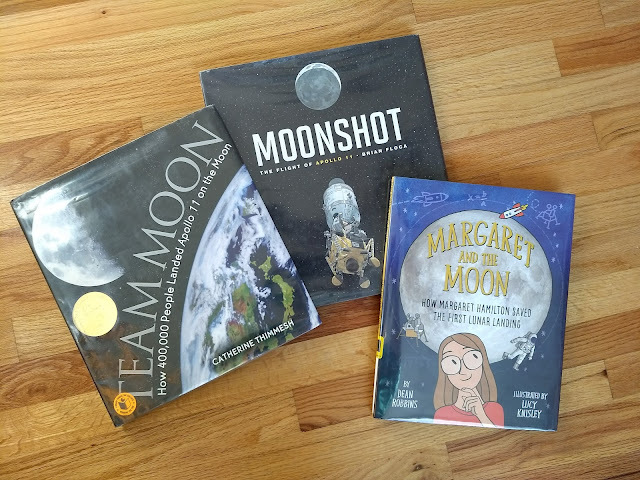 Earlier this week at the library I picked up my hold for Moonshot: The Flight of Apollo 11 by Brian Floca (which I placed after reading Floca's Locomotive with the Read-Aloud Revival community). Walking from the hold section to the children's section, I walked by a Women's History display and saw Margaret and the Moon: How Margaret Hamilton Saved the First Lunar Landing , which I grabbed. While still in the library, I browsed the book to see if I wanted to check it out. By the time I reached the additional notes at the end (I love this part of books), I knew it was a keeper. 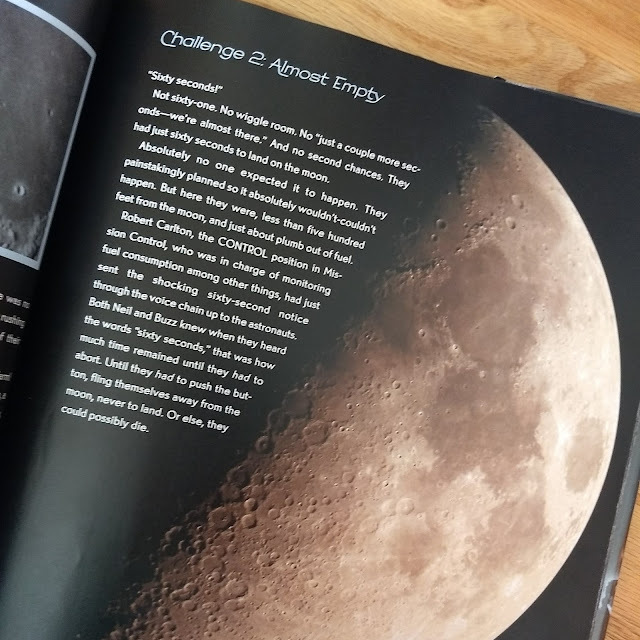 Looking over the related recommended books for kids at the end, the title Team Moon: How 400,000 People Landed Apollo 11 on the Moon caught my eye (such a great title). So I did a quick library catalog search and found it right on the shelf in that very library! 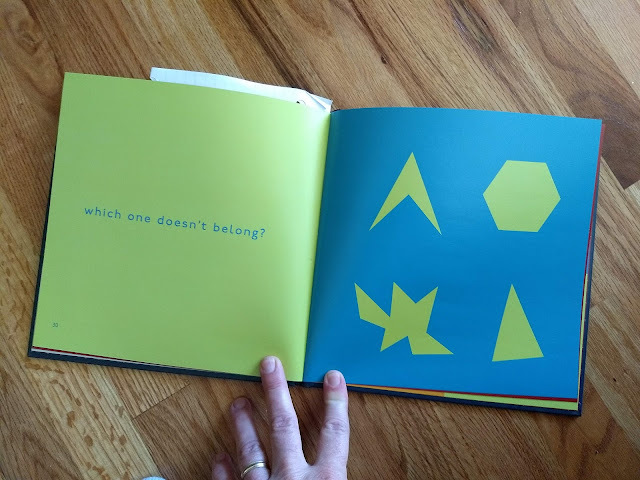 I read Margaret and the Moon to my kids 10, 8, and 6 at bedtime (short enough for the youngest listeners and highly recommended), and previewed the other two books by looking at the illustrations and reading the headings and a few captions together. I then offered Moonshot and Team Moon (along with Margaret and the Moon) to my kids to look at on their own in bed, which they happily did. Apollo 11 bonanza! And almost entirely by happenstance. I also plan to read aloud Moonshot, but it is pretty long, so I requested the audiobook from the library and will listen to that while looking at the book with my kids when the hold comes in. Team Moon is much longer, but could definitely be read aloud with older kids and over many days. It has many nail-biting accounts of challenges and near disasters encountered during the mission (see photo below), and is a fabulous celebration of teamwork and unsung heroism. Tons of drama and excitement in Team Moon! We are major fans and heavy users of the public library. Our family has two cards in our city system, and one card in our county system. We can check out 100 books with each card and we are usually maxed out (at 300 titles!). I frequently haggle with my children over how many titles each gets to check out at the library. Keeping track of these checkouts and avoiding fines is serious business around here. It is a wonderful problem to have. I would say that the most successful part of our homeschool experiment has been reading aloud. I read aloud for 20+ minutes every morning, and sometimes again after morning recess or at bedtime. 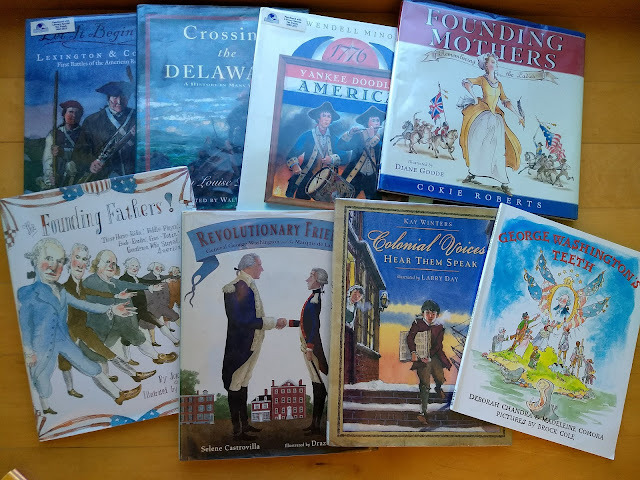 I get titles related to their U.S. History and Zoology classes, or to the artists, composers and poets we are studying together in our homeschool, or just pick up whatever random title strikes one of our fancies. I sometimes consult recommended books online, but usually I just browse whatever is available in the library. 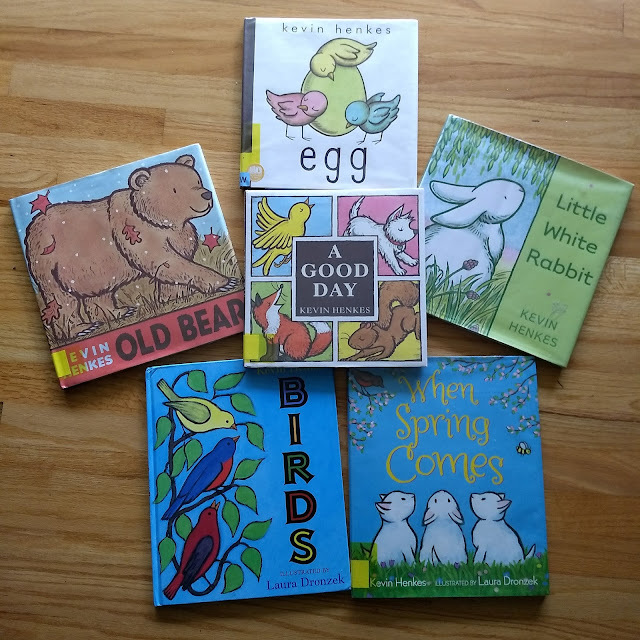 Sometimes I walk along the picture book shelves and pull off a stack of titles by the same author. We have had tremendous luck and success with this method. I am so grateful for the amazing selection of children's picture books in our library and the fabulous librarians who make the purchasing decisions and rotating displays. How do you use your public library?